Boo here, back at it again and today, I want to talk to you about a ruff subject for some. Smoking! Thanks to the fact that it’s a much safer and healthier alternative to cigarettes, more and more people are switching to vaping than ever. It probably doesn’t surprise anyone to learn that the vast majority of the vaping community are millennials…which also happens to be a pretty large segment of the apartment renting community. Of course, the cool millennials also have pets, so it’s no wonder you’re here trying to find out if vaping is in fact safe for pets. We all know that when someone smokes, the second-hand smoke that they put out is harmful to others including people and pets. The chemicals in the smoke can cause sickness in humans like lung disease, throat issues and heart problems. But, it doesn’t stop there. We pets are affected too. Luckily, our owners have found a new alternative called vaping, otherwise known as e-cigarettes. The best part is that they are considered to be 95% less harmful than tobacco products! That’s right, even if you see your pet showing curiosity in your vapor clouds, the vapor itself is harmless to them. What is harmful? The harmful stuff is the actual liquid that comes in the bottles or capsules. Along with nicotine, the liquid is made up of Vegetable Glycerin, Propylene Glycol, and flavoring to make it tasty. The nicotine is what makes the liquid the most dangerous to us pets. If you haven’t heard of Propylene Glycol, it is a synthetic organic compound used in inhalers and in several different dog foods. Although it hasn’t been proven to be harmful to dogs there are theories that ingesting this compound can cause harm to cats. 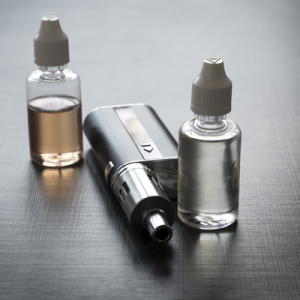 So, while the vapor that results from vaping is harmless, the liquid that contains the actual nicotine, can be fatal to us if not treated quickly should we ingest it. That’s why it is absolutely necessary to keep the bottles and capsules away from us. If you aren’t sure if your pet has ingested vapor liquid, there are a few signs to look for including color changes or spots on their mouth, vomiting, panting, high pulse rate, tremors and seizures, loss of appetite and other out of the normal behaviors. It’s better to be safe than sorry, so if your pet is showing these signs and you think there is a possibility that they ingested some of the juice, contact your vet or the Pet Poison Helpline at 1-800-213-6680. We have to give vaping a paws-up for safety and we pets like it much better than tobacco smoke. Just remember, be responsible and keep the bottles and capsules of e-liquid out of reach of our curious mouths, continue to vape in well ventilated areas and keep your actual mod/e-cig’s/vape pens as well as charges and batteries, out of reach from your pets. Boo out!